I am a numbers person so calculating the value of a NotebookingPages.com Lifetime Membership is an easy way for me to decide if the cost is worth the value you receive in return. This calculation is influenced by several factors. 1. Are you a notebooking family? Do you already use notebooking pages? Then the membership would be more valuable to you because you have already decided to use this method of homeschooling and having a huge library of premade notebooking pages at your fingertips would greatly streamline your notebooking process. 2. Do you have younger children? Do your older children enjoy notebooking as part of their homeschool work? The NotebookingPages.com membership would benefit you as well. The more years you have to take advantage of the 1,000’s of notebooking pages, the more valuable the membership would be for your family. The more children you have the higher the value as well. 3. Does your family shy away from curriculum that uses workbooks and premade fill in the blanks worksheets? The Treasury Membership would be a wonderful alternative to workbooks and allow for your child to personalize their learning on a daily basis. 4. Do you have a visual-spatial learner like I do? Notebooking has been a way for him to organize his thoughts and doodles into a binder full of beautiful pages that are now a wonderful keepsake. 5. Are you thinking about using a timeline binder as part of your long-range homeschooling goals? The NotebookingPages.com Treasury Membership comes with a complete system for building a customized timeline. It is as easy as deciding on a style and then printing out the coordinated pages. My son has used these pages over the past two years as part of his study of modern history and the results are stunning. 6. Our nature notebooks are full of pages from NotebookingPages.com. The Treasury Membership will give you access to literally hundreds of blank pages to choose from for your notebook. My favorites are the bird pages and the wildflowers pages (in case you wanted to know). 7. Are you interested in doing a state study or a president’s study? There are complete sets of pages to use in both included in your NotebookingPages.com’s Treasury Membership. There are also many sets for individual countries that we used as part of our high school world geography course. 8. Are you a planning procrastinator like I am ? I have found having the Treasury Membership to be a huge last minute help in pulling together a week’s worth of work in a minimum of time. I can easily find notebooking pages to go along with just about any topic I need for our studies or I can pull from my small stash of more general pages and allow Mr. B to customize the page as he wishes. 9. The Notebooking Publisher gives the Membership even more value. With this online tool you can make ANY page on ANY topic with a few clicks. 10. Have you made it through the list and you still aren’t sure of the value? My best recommendation comes from my continued use of NotebookingPages.com. You only need to read through my blog over the past few years to see in words and images that I not only use this product but love it. That is my highest stamp of approval for any product. Disclosure: I am an affiliate for NotebookingPages.com and I receive a commission if you click my links and make a purchase. 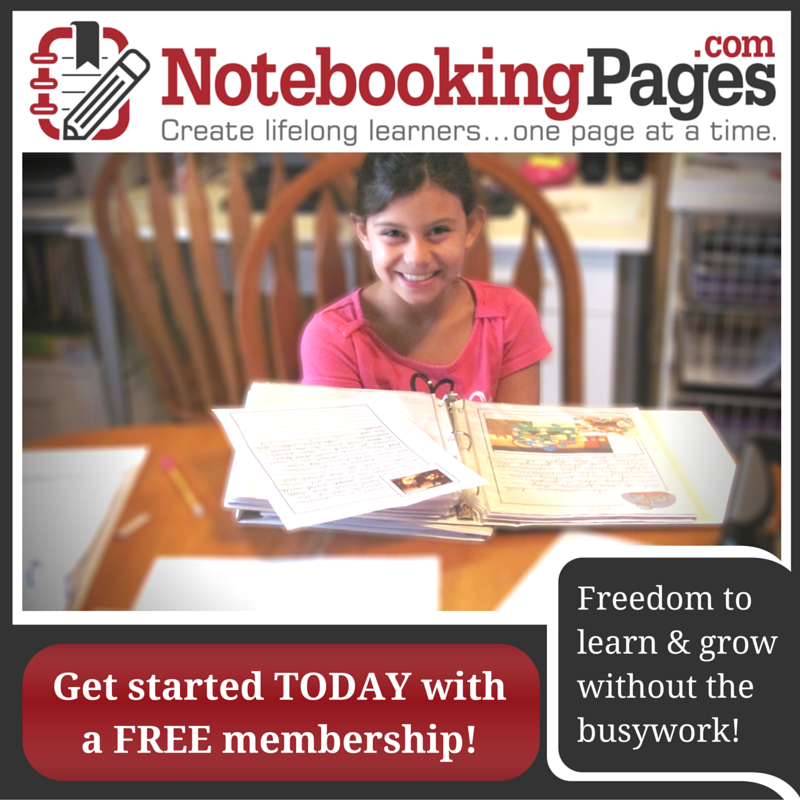 I am also a dedicated and loyal customer and user of NotebookingPages.com and am so glad that I have been able to use these products in my own homeschool for many, many years. ← Harmony Fine Arts Year-End Discount Sale! I couldn’t agree with you more, Barb! I’ve found that the membership is one of the few things we pay for that is worth the money, year after year, and especially now that the Notebooking Publisher is included…..it has been a wonderful tool for my daughter who writes beautifully but has illegible handwriting. The results using the Notebooking Pages sets are ones that my children are proud of and come back to over and over. We are slowly getting the hang of using Notebooking Publisher but my son is finding he likes to actually hand write his pages. This means that I am on publisher making custom notebook pages by picking the layout and adding my own images. I love the flexibility.